Wallace H. Mienk was born on January 13, 1926 in Redford Township, Michigan to the late Walter and Luella Mienk. He passed away on February 8, 2019 in Commerce Township, Michigan at the age of 93. As soon as he was old enough, Wallace enlisted in the United States Army. 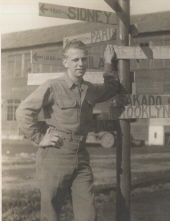 He served as a sharpshooter during WWII, earning the rank of Private First Class prior to his discharge. At home he provided for his family as a mail carrier with the United States Post Office. He walked his route in Detroit for 30 years. In his retirement he kept busy with family and friends. Wallace was an avid sports fan, cheering on the Detroit Lions and Tom Brady’s New England Patriots. During the summer he cheered on the Detroit Tigers, and could often be found putzing in the yard, making sure every was in order and well maintained. Wallace was the loving husband of Kathleen, who preceded him in death in 2005. Cherished father of Bonnie (RIchard) de Manincor and Ron (Pattie) Mienk. Proud grandfather of Derek (Shannon) Mienk, Melissa (Jim) Ricketts and Corey Ricketts and great-grandfather of Austin Scott, Billy Ricketts-Royer, Cameron Mienk and Caleb Mienk. He is preceded in death by one brother and two sisters. The Mienk family will receive friends for a memorial gathering on Tuesday, February 12, 2019 from 1-4 pm at the Lynch & Sons Funeral Home, 340 N. Pontiac Trail (3 blocks south of Maple Rd) in Walled Lake. Mr. and Mrs. Mienk will be laid to rest at Great Lakes National Cemetery in Holly, Michigan at a later date. For those who wish to make a memorial contribution in Wallace’s memory his family suggests donations to the Alzheimer’s Association. "Email Address" would like to share the life celebration of Wallace H. Mienk. Click on the "link" to go to share a favorite memory or leave a condolence message for the family.